Deliciously warm water, a glorious endless beach and Robinson Crusoe style remoteness. Simple luxury at its best. Villa privacy or family escape. So unspoilt, it feels like a secret. True relaxation, immersed in nature. …Travessia is an Eco Beach Lodge that is all about understated barefoot-luxury. A mere one and a half hours drive from the airport of Inhambane, and just six kilometre of sand track away from the main road, the lodge is accessible enough for a long weekend break and yet remotely enough still to give you an instant cast-away feeling. Take a walk on our endless beach, relax in the shade of our palm grove, paddle out or gaze at the sea from our rim-flow pool, or accept an invite from the neighboring community. Sophisticated whilst down to earth, with no-one around for miles, Travessia is for families, individual travellers and couples alike. How to spend your time? Check our sample itineraries for inspiration. Self-drive holidays in southern Mozambique become increasingly popular. Explore the coconut route with Travessia in your own time (and wheels). Here are some ideas, starting from Maputo or Vilankulos . Travessia Beach Lodge is only a 2hrs 30min drive away from Vilankulos and only 1hr45min from Inhambane Airport. For flight options into Maputo, Inhambane or Vilankulos from Johannesburg and Nelspruit, check the attached overview. Idealistic outdoor engineer Dave is the South African answer to Gyro Gearloose, just slightly more perfectionistic. His wife Anne is the appropriate counter part: Dutch import, with a talent for pairing vision and reason. 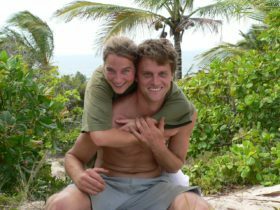 Anne shares Dave’s passion for the African outdoor and they are both driven by the sustainable greater good. 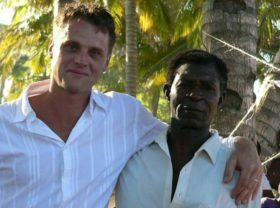 The Landrover whisperer and his wife are fluent in Portuguese and well connected with the villagers and Mozambican authorities. 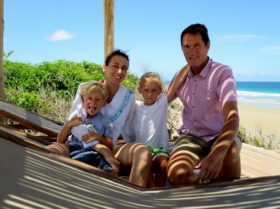 With Dave having spent most of 2013 on site to once more kick-off construction, they are now both back living in Cape Town with their two children. In this combination of Namibian farm boy gone mining entrepreneur, and German journalist and communications consultant, the famous teutonic efficiency meets South African entrepreneurial thirst. Haje and Angela both enjoy coming up with and implementing ideas and are usually unable to say no when a good opportunity presents itself. Add to it a good measure of travel and adventure and you can be sure that curiosity kicks in. 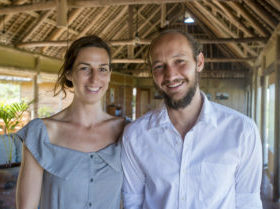 Haje part-time and Angela full-time, they work closely with Adel and Ben, overseeing Travessia’s budget, procurement and marketing and managing the development. When they are not commuting between Namibia, Germany, Mozambique and wherever else business and pleasure takes them, they live in Cape Town with their two children. Living and working in remote parts of Africa, where problems aren’t simply solved by picking up the phone and calling an expert, takes a special breed of person. Which is precisely why we are so blessed to have Adel and Ben as Travessia's lodge managers. Adel is a whizz with a chef's knife, from bush camp cooking to catering for weddings and private dinners. Ben, a former South African long bow champion, is not only a master of all motor works but also a carpenter with skilled hands. Peacefully observant, his attention to detail matches Adel’s creative thinking. Well travelled and professional, they bring a wealth of skills, experience and creativity. With their intuitive minds, great understanding of guest relations and a passion for living in diverse locations, they are not only the kind of ``specialised allrounder`` that you need for a place like Travessia. They are also exceptionally nice people to have around. This image of Dave and Senhor David is in honour of the ``Father of Travessia``, David Saiete, who sadly passed away in March 2014. Senhor David was initial in establishing the partnership between the local community and Dave and Anne and took care of Travessia after Dave and Anne had to leave for South Africa and before construction was resumed in 2013. If it had not been for him, chances are that Travessia would not be what it is today. His reliability, loyalty, quiet strength and wisdom will remain unforgotten. It is impossible to describe this place. Water as warm as a bathtub and not a soul to be found for miles in either direction on the pristine beach. Really spectacular and probably the best accommodation I have seen in Mozambique. Thank you for an unforgettable trip of a lifetime. We will be back one time! I have been lucky to travel a lot in my life but I have never found such paradise as Travessia Lodge. If you are looking for a place for your soul … this is the place to come to. I really enjoyed my walk in the village and hearing how the resort works with the community in sustainable ways. I wish all hotels were this community based. Rated our best family holiday yet - when you don't see your kids for a week, and you get to read 2 books in that time, and feel like you have been away for a month, you know it’s ticked all the boxes!